If you are developing apps professionally with revenue in mind one of the things you need is stats. There is a component from JVESoft which allows you to track stats in your Delphi XE5 Firemonkey apps on IOS using Google Analytics. 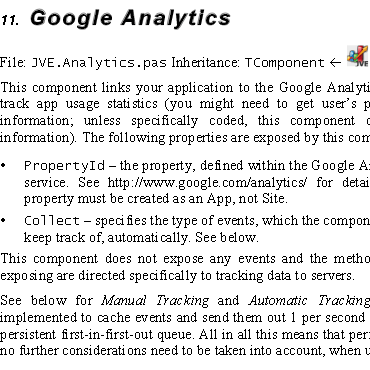 The Google Analytics component is part of a larger component suite from JVESoft that for the price is awesome. It has practically everything you need to launch a real professional app in the app store (stats, ads, in app payments, app ratings, push notifications, and more). In any even the Google Analytics component will track things automatically or manually. For example, it can track each time your users open a new form in your app. It also tries itself into all of the other components in the suite and gives you stats on when they are used as well. There is not much documentation and there is no trial but it includes source and is well worth it for the price. Click over and purchase the JVESoft component suite with Google Analytics support.